Ideally suited for areas where basic sack holders are required and fire risk is minimal. Available in 70L and 90L capacities. 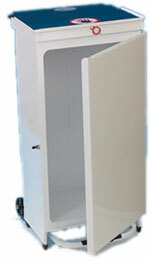 Front opening door for easy bin-liner removal and easy cleaning and sterilisation. 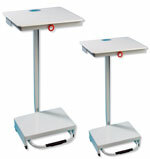 Lid is hands-free, operated by foot-pedal only, reducing cross-contamination. The lid also features dampered, silent closing. Double axle wheels provide easy movement. 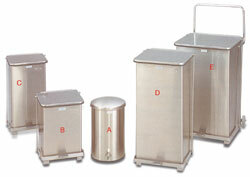 Sturdy, foot operated bin-liner bins, designed for industrial and clinical waste in factories, labs, schools, hospitals, etc. Standard bins come in 70L and 90 L sizes and come with double axle wheels. A 20L, hands-free, foot-opened only bin is also available, reducing cross-contamination risks, this bin also features dampered, silent closing and will not bang or make noise when shutting. Round models come complete with a vinyl base ring to protect floors and reduce noise. Square models feature a hinged lid restraint mechanism to protect walls and equipment and steel legs with nylon buttons to protect floors. 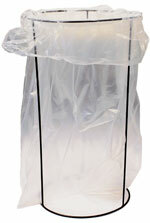 All bins are supplied with a rigid, plastic liner. Sack holder, 900mm high and 550mm diameter. Holds all refuse sacks up to 90 Litres. 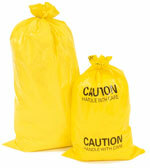 Yellow refuse bags, 280g weight.